We all start small...but have big dreams! I mean, seriously, no one can predict the future, but its so fun to look back on the past for those little nuggets that become gems! There are little, tiny blurbs throughout these scribes of history that really show how a dream starts so small - but with a little faith, trust and pixie dust become magical. I stumbled across this article today. 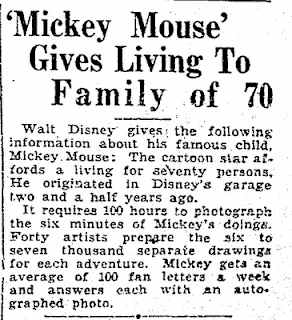 It was published in the Seattle Times, back on 4-12-1931. Read it, its short. Then think "WOW, how that dream blossomed!" Go ahead, be amazed! I was! P.S. Wonder where I can get one of those autographed photos!